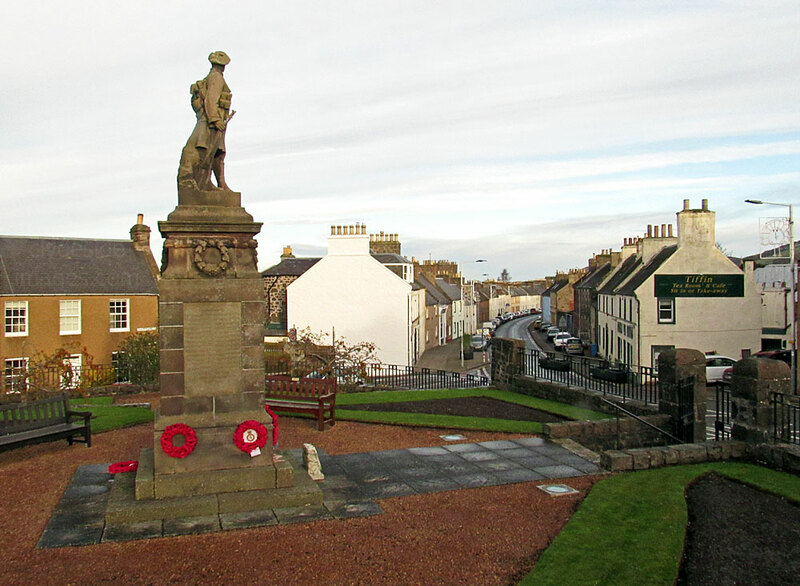 ​The Auchtermuchty war memorial stands at 'The Cross' which is on a high point in the middle of the old town. The twisting streets here are centred on a medieval peel tower, which now forms part of the library, and there are a number of well-preserved buildings which date from the 17th and 18th centuries. 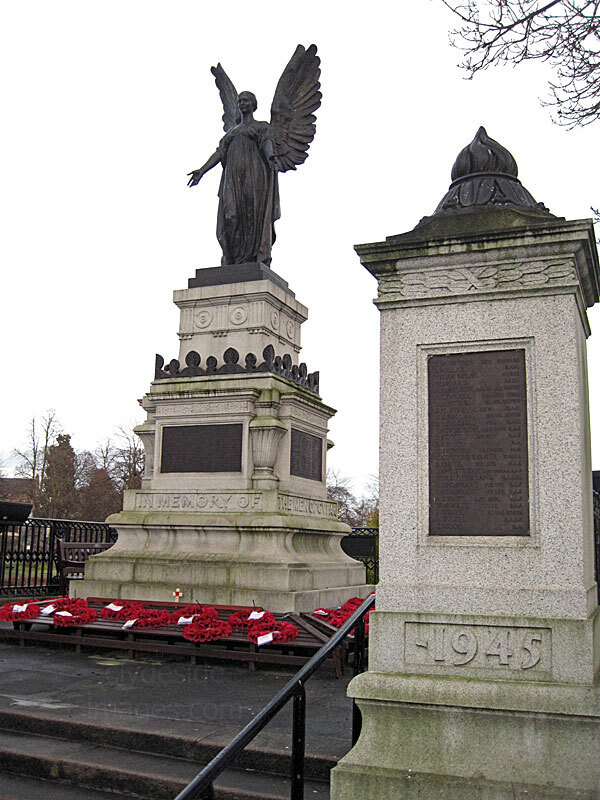 ​The memorial was designed by Glasgow architect James B. Dunn in collaboration with Edinburgh sculptor Alexander Carrick (1882-1966). It takes the form of a tall freestone shrine featuring the carved half-scale sculpture of a soldier with head bowed and arms reversed which is set in an arched niche at the front. 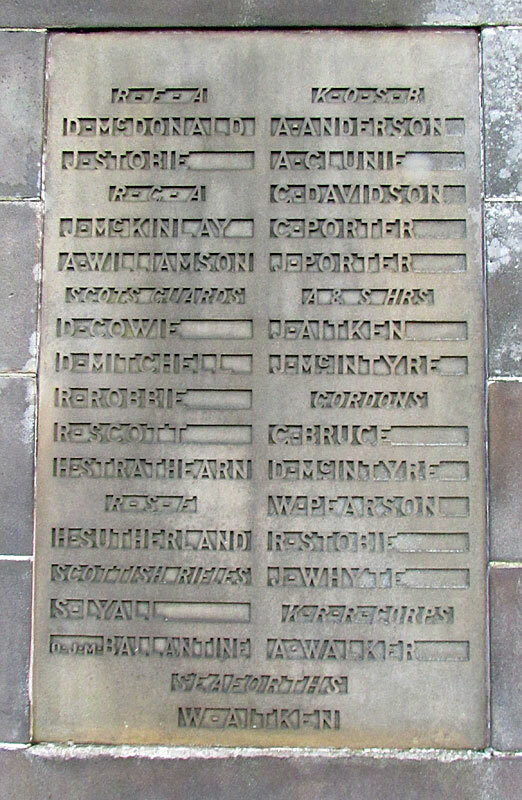 The commemoration and names of the dead are carved into the remaining three sides of the monument and there are carved regimental badges around the top. 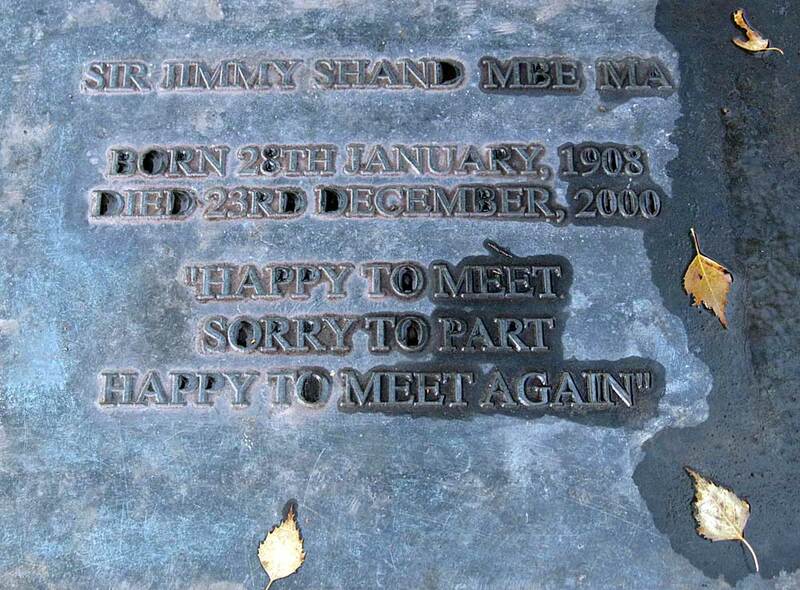 James Shand, better known as Jimmy Shand, was born in East Wemyss, Fife, on 28 January 1908, the son of a miner. 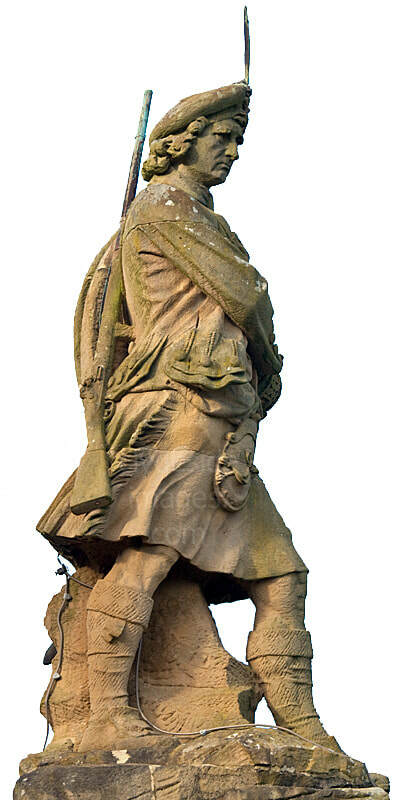 The family soon moved to Auchtermuchty where this life-sized statue now stands. Shand`s father was a skilled musician and at an early age, with his father`s encouragement, Jimmy took up the mouth organ then the fiddle. At the age of 14, like many of the youngsters in the area he left school and started work in the local coal mine but he began to play at social events and competitions. In 1926, during the General Strike, he did benefit concerts for striking miners and was consequently prevented from returning to work at the coal fields. He got a job with the Fife Power Company instead. 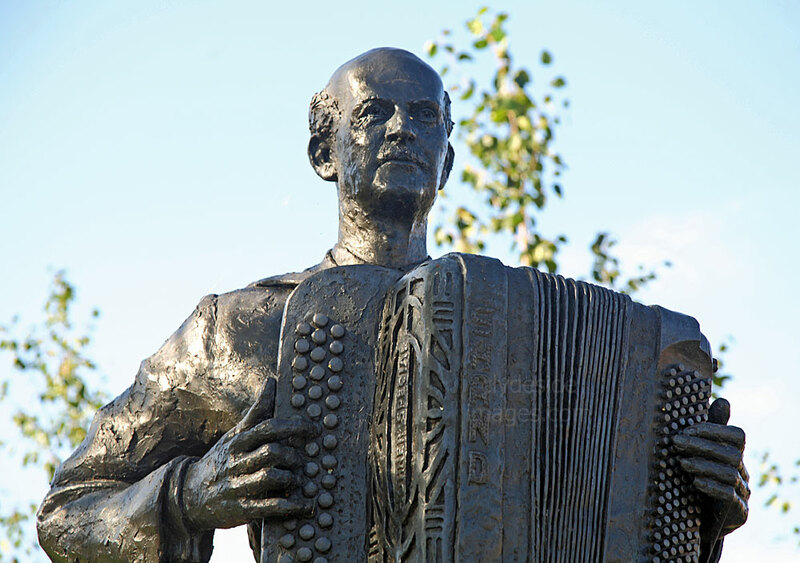 In 1932 Jimmy tried an accordion for the first time in J. T. Forbes music shop in Dundee and also came out with a new job as a travelling salesman. The proprietor also arranged Jimmy`s first recording session in 1935 and Jimmy`s style of Scottish country dance music proved extremely popular. When the Second World War broke out it was found that Jimmy had a medical condition which barred him from the Armed Forces so he joined the Fire Service. 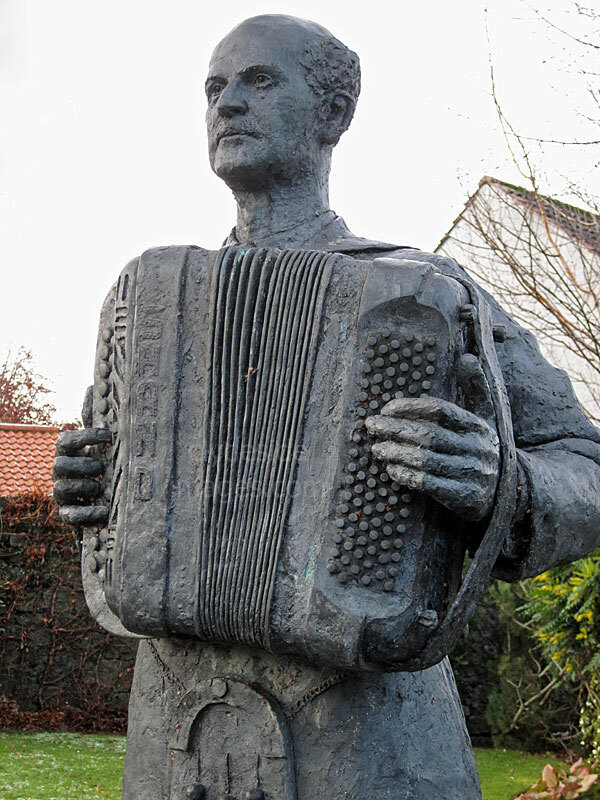 Initially he continued to play in a small dance band but by 1940 he had formed his own. Jimmy and the band went on to make records which sold in their millions all over the world. The band also travelled extensively receiving rapturous welcomes in Australia, New Zealand, Canada and many other countries. In 1955 the `Bluebell Polka` reached number 20 in the UK charts and the band appeared on the Top of the Pops, the only Scottish country dance band to ever do so. ​It wasn`t until 1972 that Jimmy finally retired and he soon became affectionately known as `The Laird of Auchtermuchty`. He passed away on 23 December 2000. 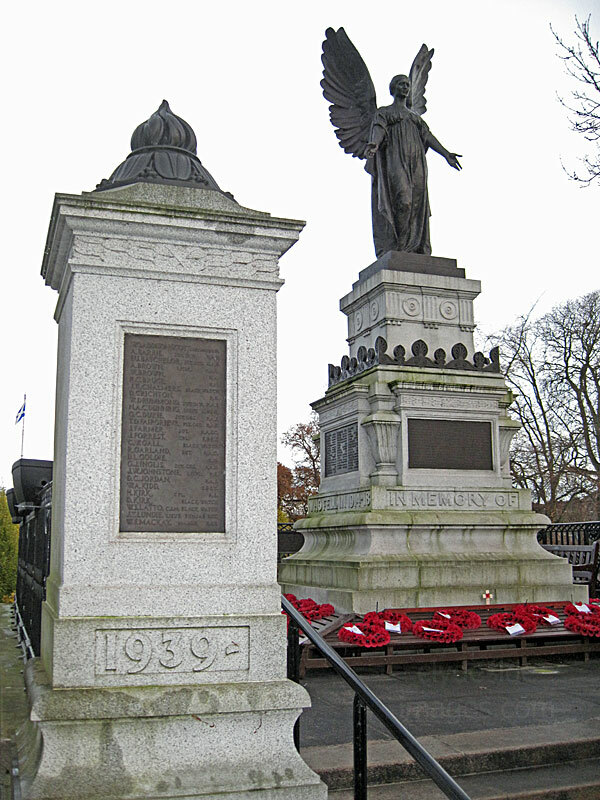 ​Cupar’s war memorial, which was financed by public subscription, was originally dedicated by Field Marshal Earl Haig when he unveiled it on 29 April 1922. 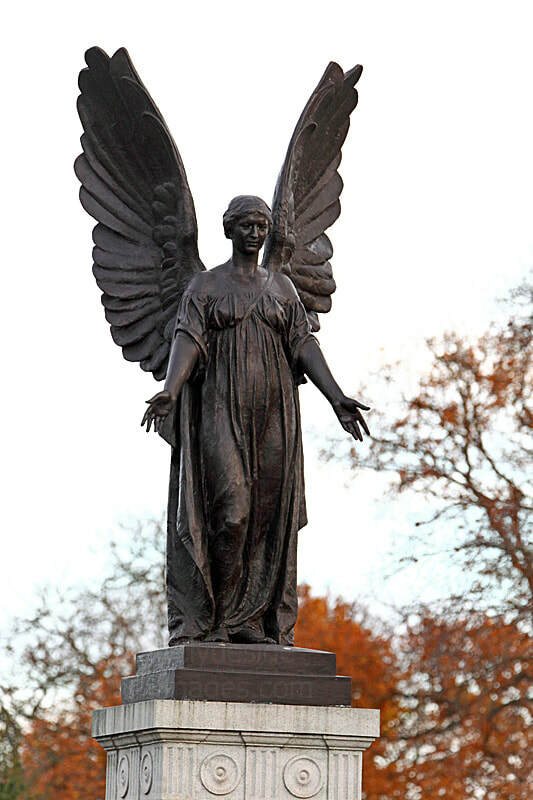 The plinth is surmounted by a bronze statue of the Angel of Victory which was sculpted by Henry Snell Gamley (1865–1928) who specialised in war memorials and figures on tombs. 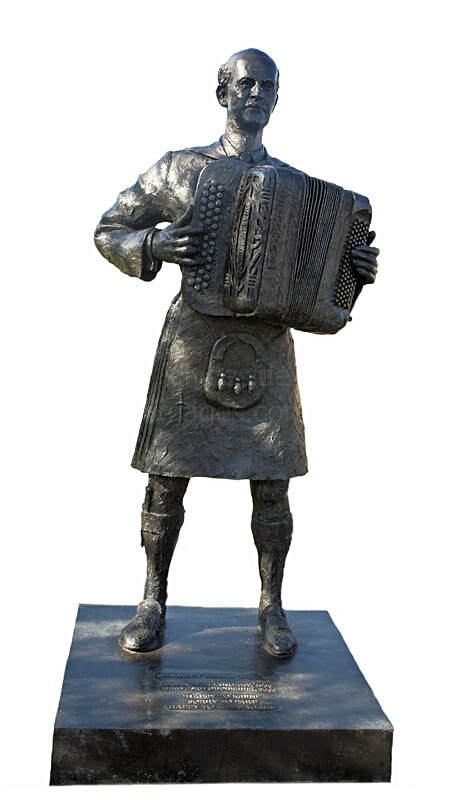 Although born near Montrose, he spent most of his life in Edinburgh where he also created figurative sculpture on prominent Edinburgh buildings such as the Usher Hall and works at Holyrood Palace. 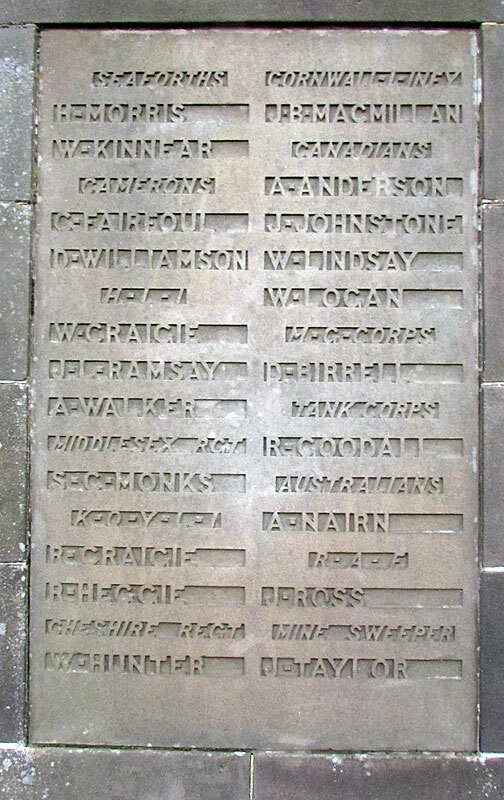 The names of the 189 military personnel form the local area who lost their lives in the First World War are inscribed on panels on each face of the main plinth with additional `gateway` pillars on either side of the stepped area at street level holding panels with the names of the dead from World War 2. In 2014, a re-dedication ceremony took place following a £75,000 restoration to combat the effects of erosion and subsidence. The work included filling the void beneath the monument with 70 tonnes of cement and replacing the slabs surrounding it. Perimeter railings were refurbished and repainted and new lighting was installed. 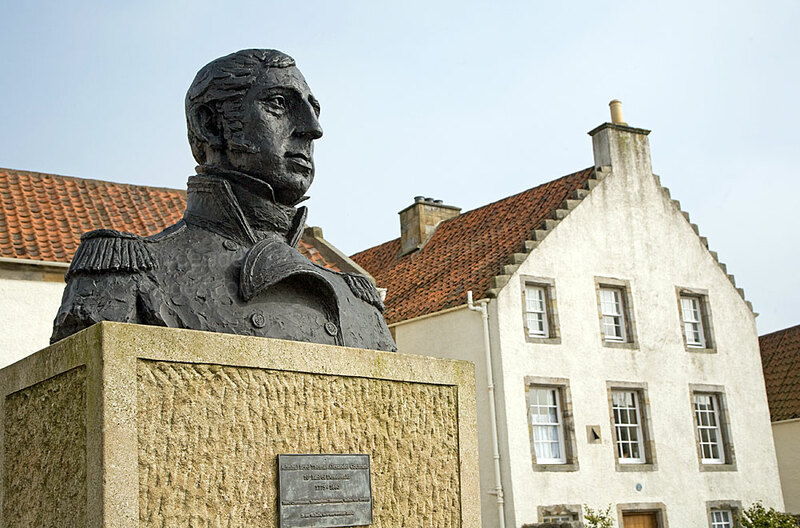 This bust in the historic town commemorates Admiral Thomas Cochrane, 10th Earl of Dundonald, (1775-1860) who was born at Annsfield near Hamilton, South Lanarkshire. 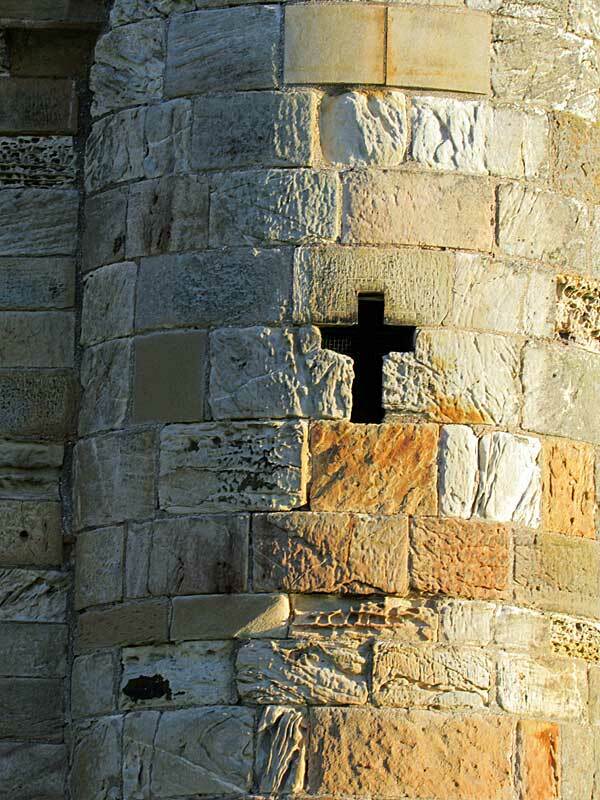 although he spent much of his early life at Culross as his family had an estate there. In July 1793, aged 17, Cochrane joined the Royal Navy as a midshipman, initially serving on two vessels commanded by his uncle, Captain Alexander Cochrane. Thomas Cochrane quickly rose through the ranks to command his own ship and fought with distinction and daring during the Napoleonic Wars which caused the French to award him the nickname of ` The Sea Wolf`. Cochrane was also a politician and Member of Parliament who campaigned for parliamentary reform and was highly outspoken regarding the conduct of the war and the corruption in the Royal Navy. This made him powerful enemies not only in the government but also the Admiralty. In 1814 Cochrane was convicted of fraudulent dealing on the Stock Exchange and was dishonourably discharged from Parliament and the Navy. Cochrane left the UK in official disgrace, but that did not end his naval career. He and his family sailed for Chile and in December 1818, at the request of the country`s leader, Cochrane took Chilean citizenship and was appointed Vice Admiral of their Navy. At that time Chile was fighting for her independence from Spain and Cochrane quickly reorganized the Chilean navy and introduced British naval customs and tactics to great effect. In 1823 Cochrane took command of the Brazilian Navy, which was at that time engaged in her own war of independence, this time against Portugal. As when he sailed under a Chilean flag, Cochrane`s experience and daring brought Brazil`s Navy important victories and ultimately had a great bearing on the country gaining its independence. Unfortunately, as in Chile, Cochrane's joy at these successes was rapidly replaced by suspicion and quarrels over pay and prize money. It appeared that Cochrane was becoming paranoid and thought that the Brazilian authorities were plotting against him. He left Brazil on 10 November 1825 and returned to Britain. Between March 1827 and December 1828 Cochrane went to Europe to assist Greece in her struggle for independence against the Ottoman Empire. Unlike his South American efforts he failed to achieve much success, mainly due to the lack of discipline among the Greek forces at his disposal. Surprisingly, in 1832, he was pardoned and reinstated in the Royal Navy and rose through its ranks once again to gain the honorary title of Rear-Admiral of the United Kingdom. He died in 1860 and was buried in Westminster Abbey. Numerous Chilean Navy vessels have since been named in his honour and each year representatives of the Chilean Navy hold a wreath laying ceremony at his grave. It is said that Cochrane`s life and exploits served as inspiration for fictional naval heroes such as Horatio Hornblower and Jack Aubrey. 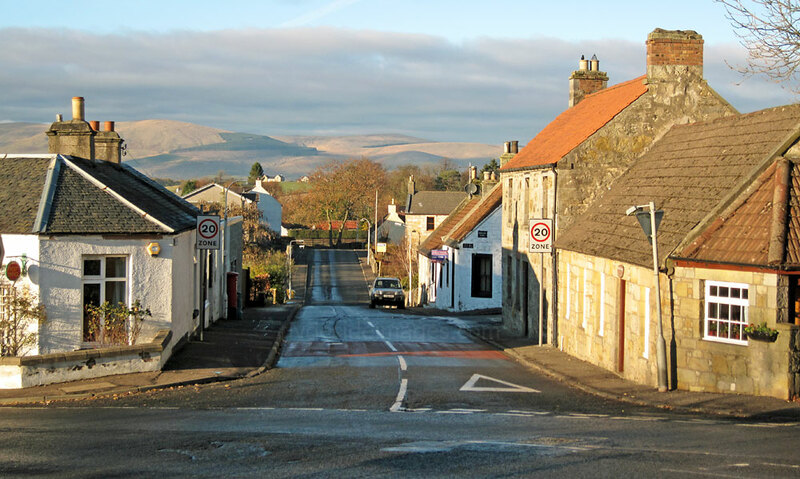 This former coal mining village stands on the Fife / Kinross-shire boundary in what was once a major coal producing region. 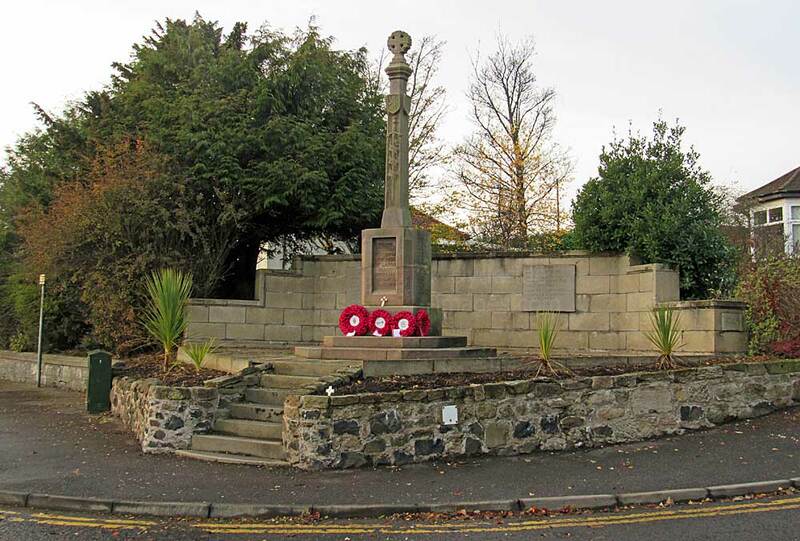 Kelty`s war memorial stands at the the cross, on the Cowdenbeath road. 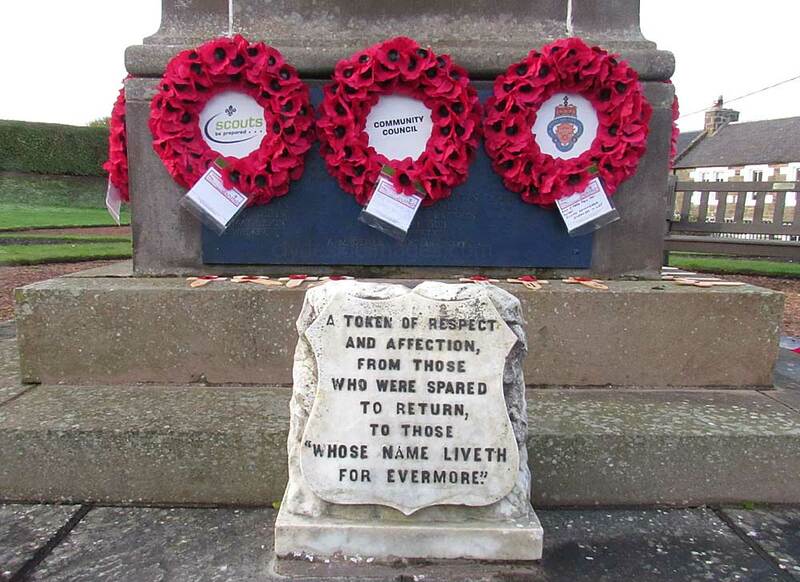 It lists the men of Kelty & District who gave their lives in the Great Wars 1914-1918, 1939-1945. 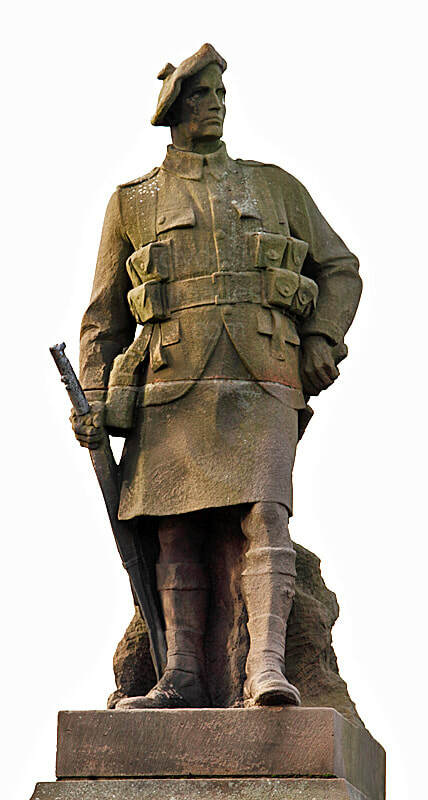 ​The kilted figure wearing a trenchcoat is by Edinburgh born sculptor Birnie Rhind RSA (1853-1933) who is responsible for several fine memorials in Edinburgh and the Lothians including the bronze of the Black Watch soldier on The Mound and the equestrian statue of the Royal Scots Greys in Princes Street. ​Post WW2 casualties listed are Robert K. Easton, killed in Korea in 1952 and Paul Lowe, killed in Iraq 2004. 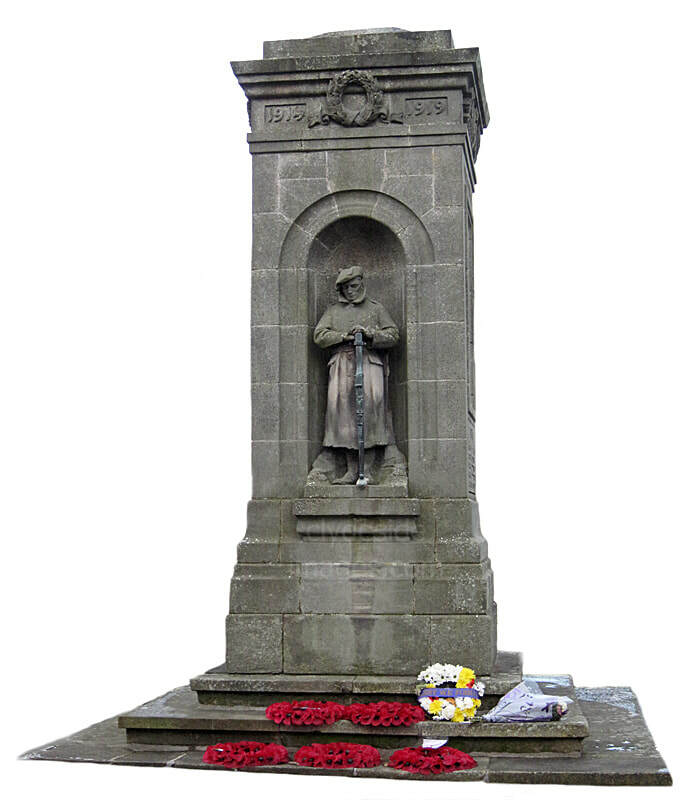 ​This memorial is dedicated to all the men who lost their lives in Kelty collieries. 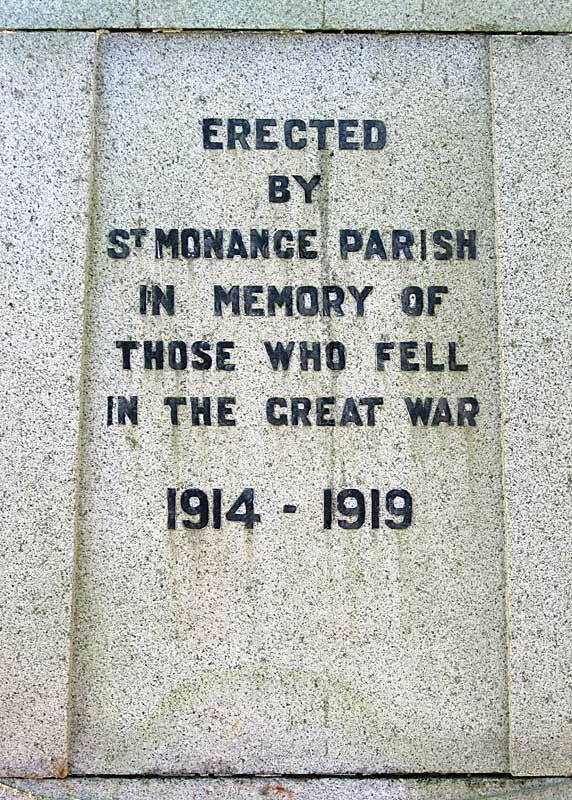 It stands outside the village library, on the opposite side of the road from the war memorial. 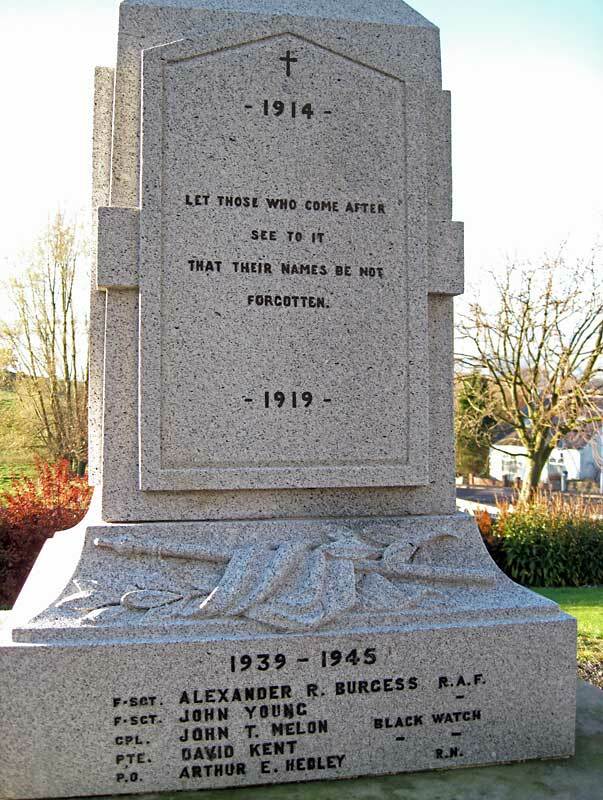 This memorial by Alexander Carrick (1882-1966) stands in the town of Kinghorn on the Fife Coast. 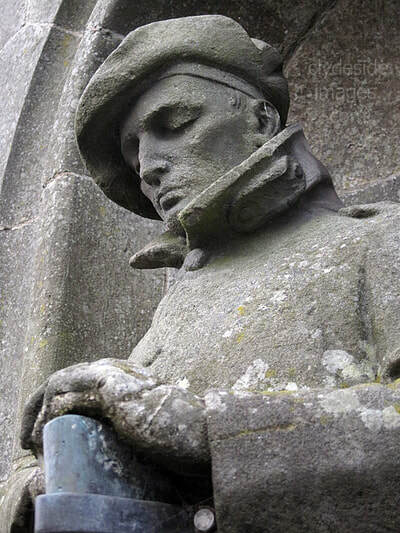 It is one of only a handful of Scottish war memorials to feature the figure of a sailor as, perhaps unsurprisingly but unfairly, the figures portrayed on such memorials were usually soldiers to represent the vast numbers that died during the conflict. 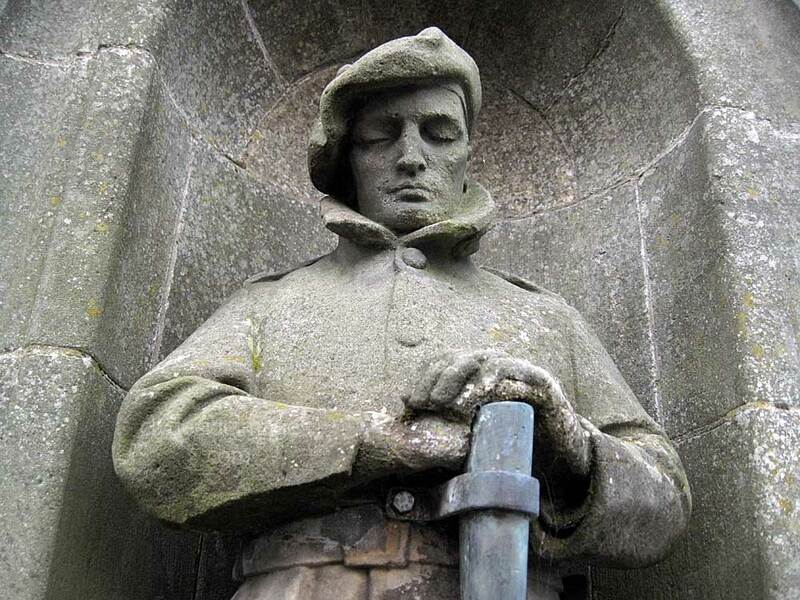 Alexander Carrick was one of Scotland’s greatest ever monumental sculptors and was responsible for numerous war memorials, not only in the UK but also overseas. Unlike most other sculptors, Carrick actually served during the Great War as an artilleryman on the Western Front and witnessed the horrors of life and death in the trenches first hand. A wealth of information on his career and other work can be found on this dedicated website: www.alexandercarricksculptor.co.uk. 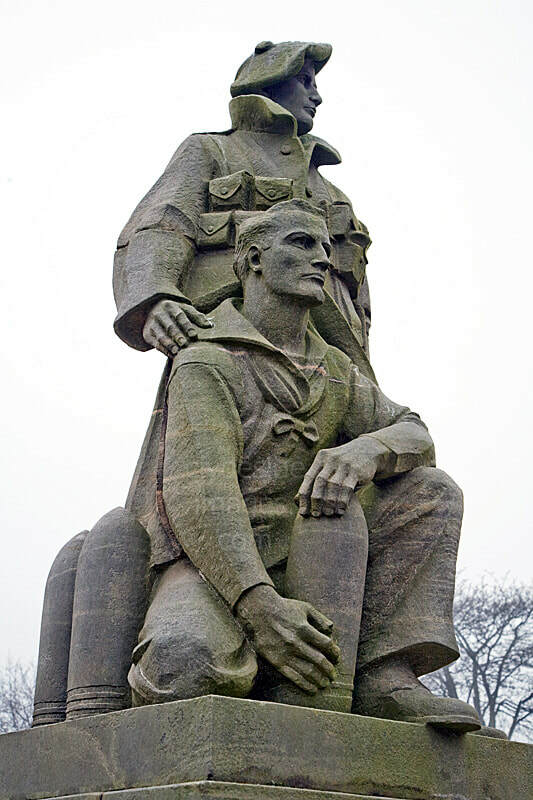 Some people, especially sailors` bereaved relatives objected that the dead of the Senior Service were not represented and in response several memorials in coastal towns included the sculpted figure of a sailor. 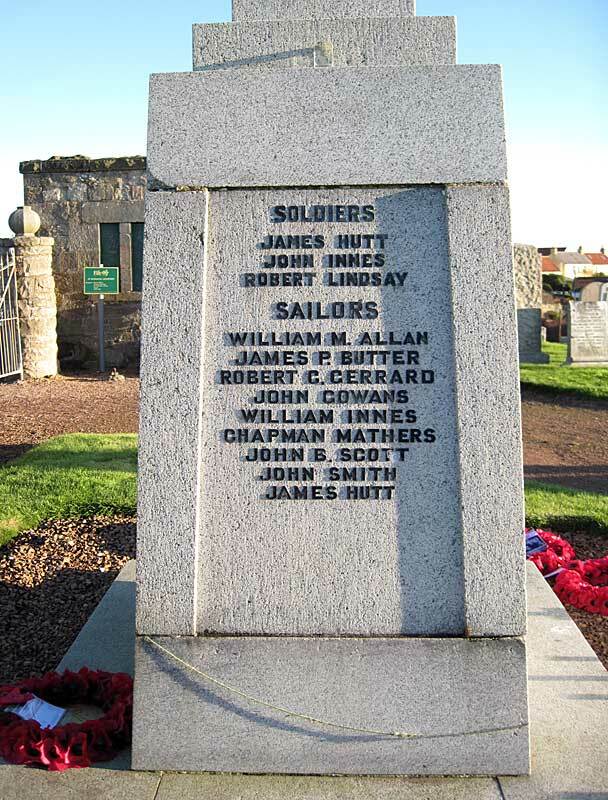 There is one such memorial at Buckie by Birnie Rhind and another of Carrick`s on the Clyde Coast at Largs. 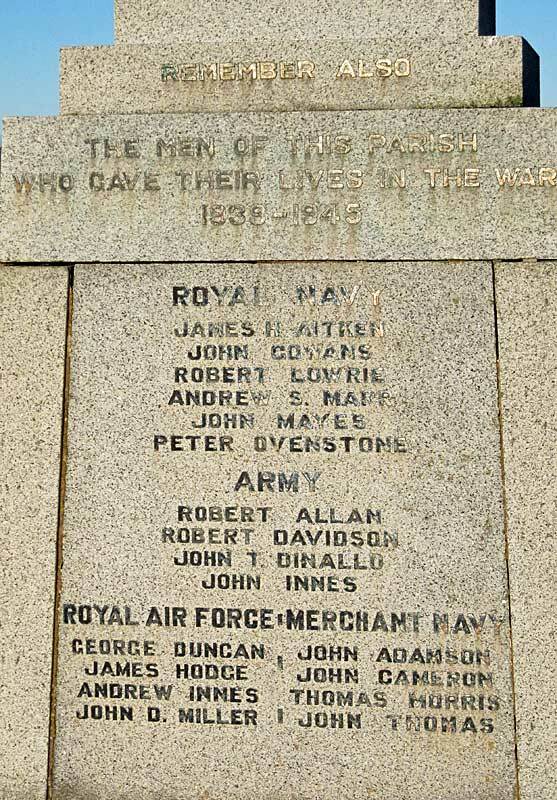 The Kinghorn memorial, which was unveiled on 22nd September 1923 by Sir Ralph Anstruther, contains 60 names from the First World War, 16 from the Second World War and one from the Korean War. 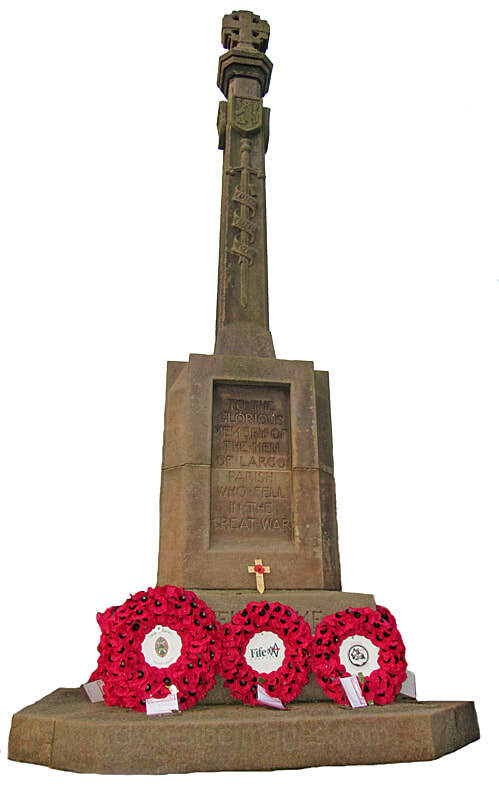 Designed by Sir Robert Lorimer, the Largo Parish War Memorial was unveiled on 19 June 1921. 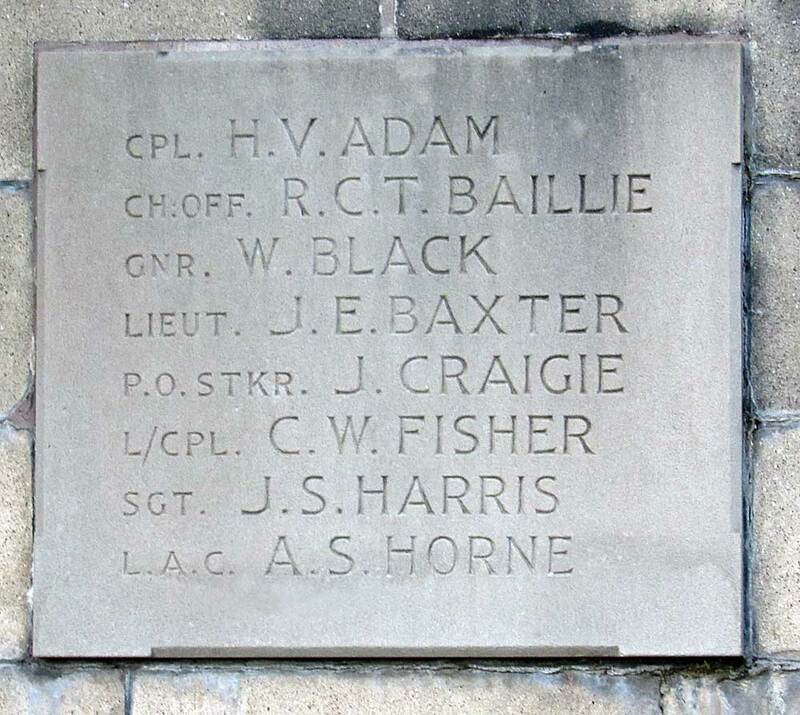 The Dundee Courier the next day reported upon this tribute to the Fallen, describing its commanding position at the crossroads close to Largo House. 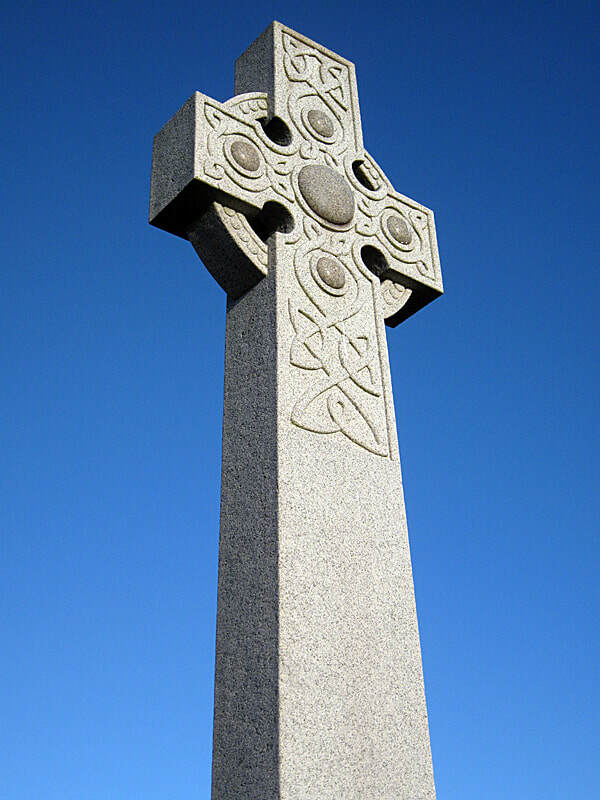 The Celtic cross-topped memorial included Scottish emblems and a sword design. At the unveiling ceremony, the Sheriff-Principal J.A. Fleming, K.C. 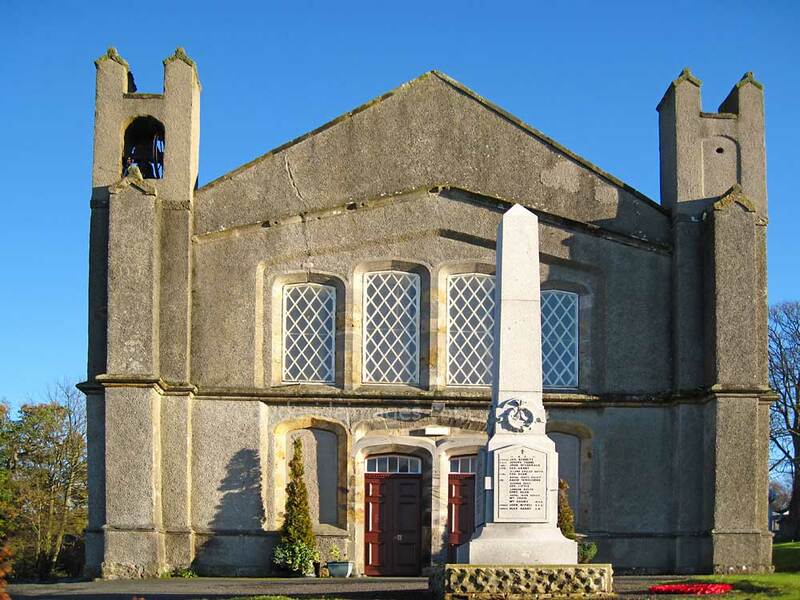 stated that 51 men had fallen of the 284 men of the parish which had served. Their names were inscribed on three panels on the plinth and were read out during the event. Music was provided by the Largo Brass Band and a choir. 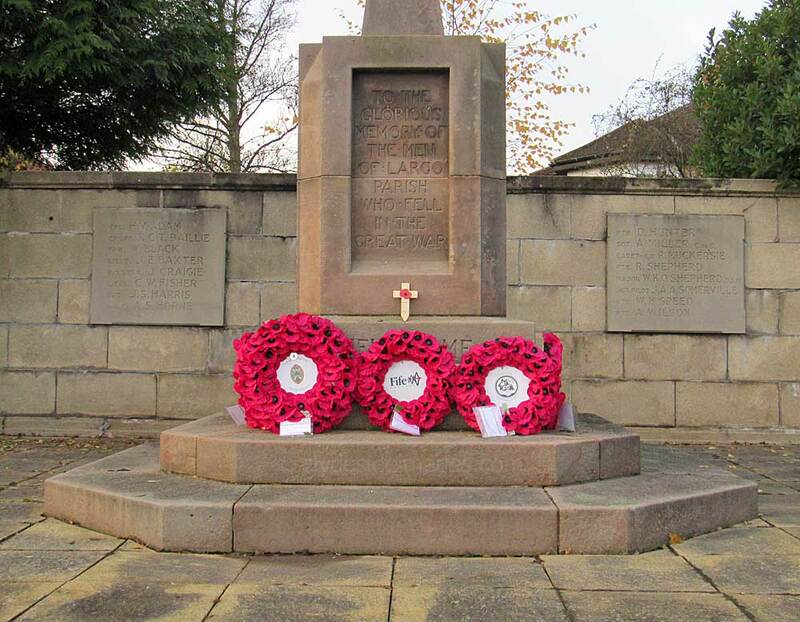 Wreaths were placed around the base of the memorial and a bugler sounded the 'Last Post'. The singing of the National Anthem brought proceedings to a close. 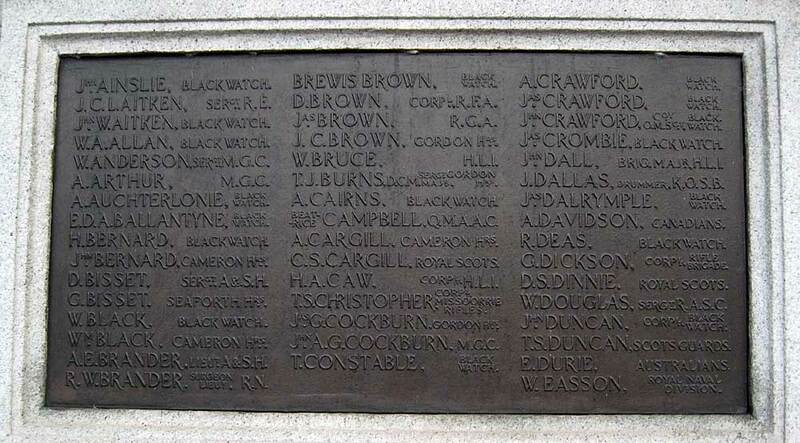 The WWI Roll of Honour lists four brothers: Capt. 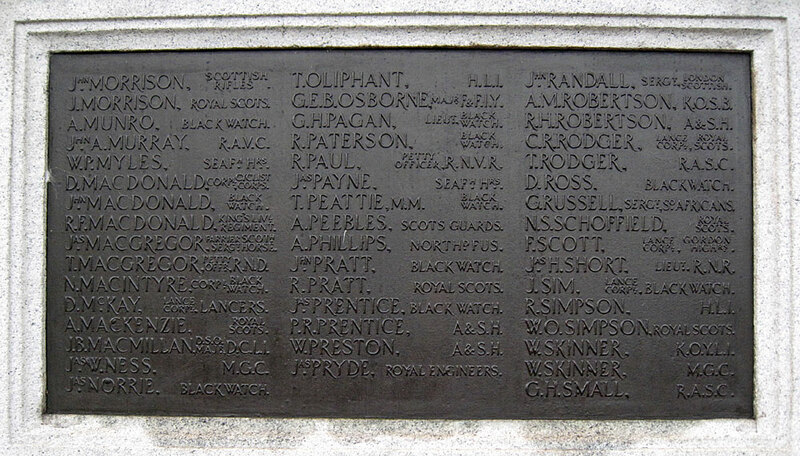 Charles Hamilton Anderson of the Highland Light Infantry (HLI), died 19 December 1914, 2nd.Lt. Alexander Ronald Anderson, died 8 October 1915, Capt. 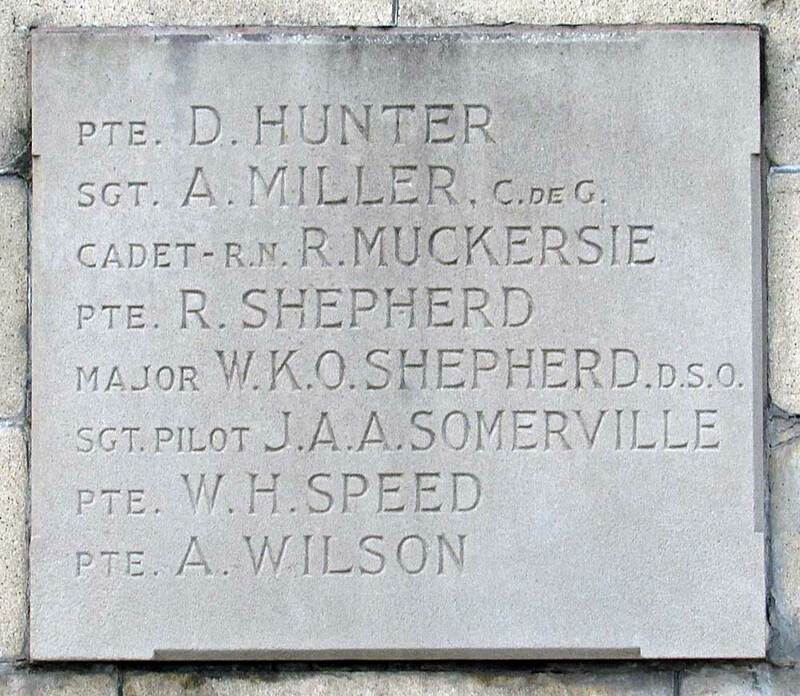 Edward Kerr Anderson, Royal Flying Corps (HLI) died 16 March 1918, and Lt.Col. William Herbert Anderson V.C. (Victoria Cross) HLI, who died on 25 March 1918 - a horrendous sacrifice for one family to make. ​The Largo WW2 memorial takes the form of a wall which has been built immediately to the rear of the Great War memorial. At each end of the wall it bears the dates 1939 & 1945. 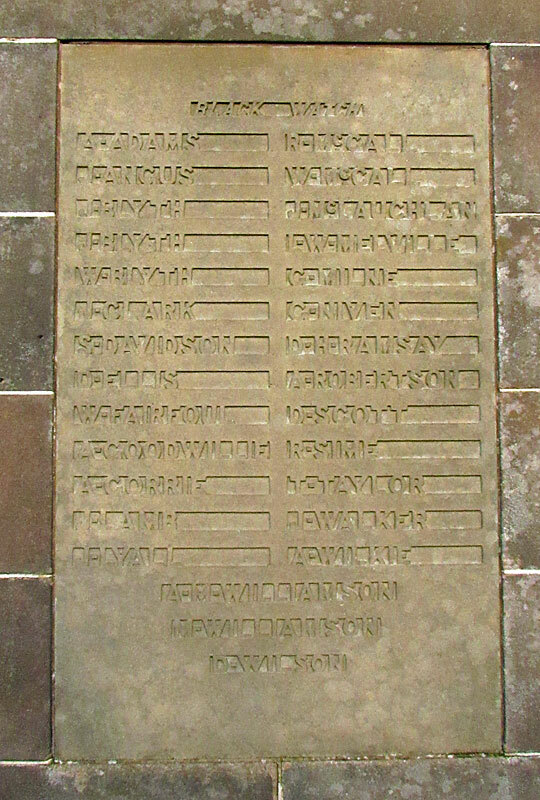 The names of the 16 men who lost their lives have been inset to the wall on stone tablets. 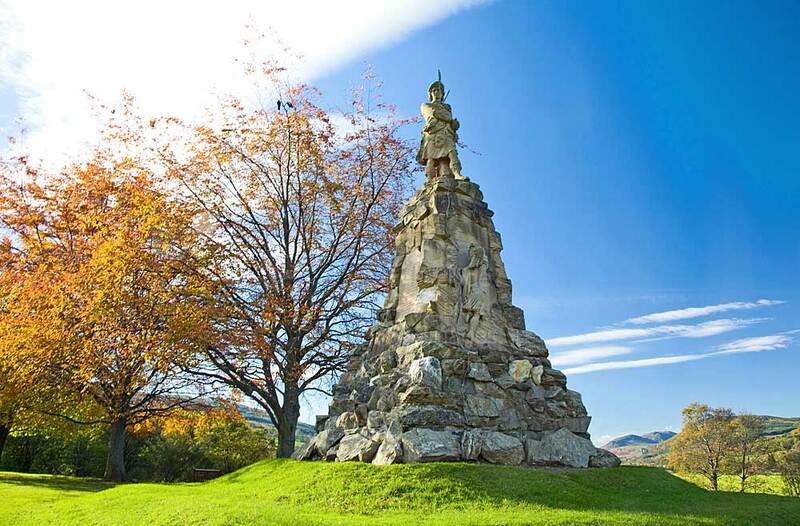 ​Newburgh is a Royal Burgh and parish of Fife which overlooks the Firth of Tay with the land immediately to the south climbing steeply to form the eastern end of the Ochil Hills. There was probably a fishing settlement here by 1191, which was the year chosen by David, 1st Earl of Huntingdon, who was the younger brother of both Malcolm IV and William I, to found Lindores Abbey which lies to the east of modern-day Newburgh. 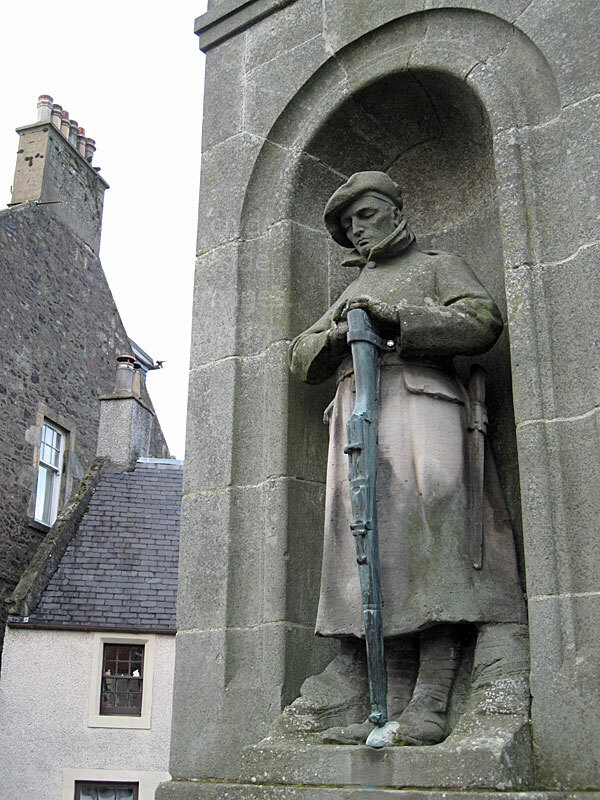 The Newburgh War Memorial is a tall freestone pedestal of classical design supporting the sculpture of a highland infantryman by acclaimed Edinburgh sculptor Alexander Carrick (1882 – 1966). 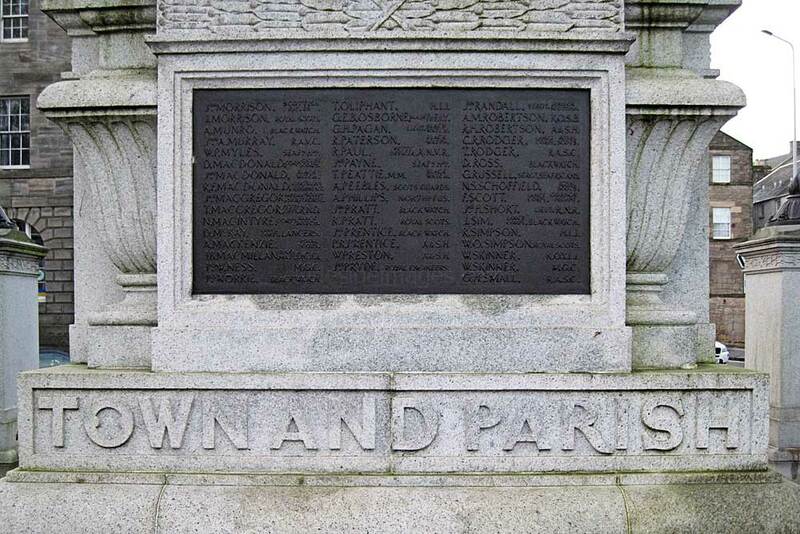 The dedication and names of the Fallen from WWI are listed on stone tablets set into the faces of the pedestal. 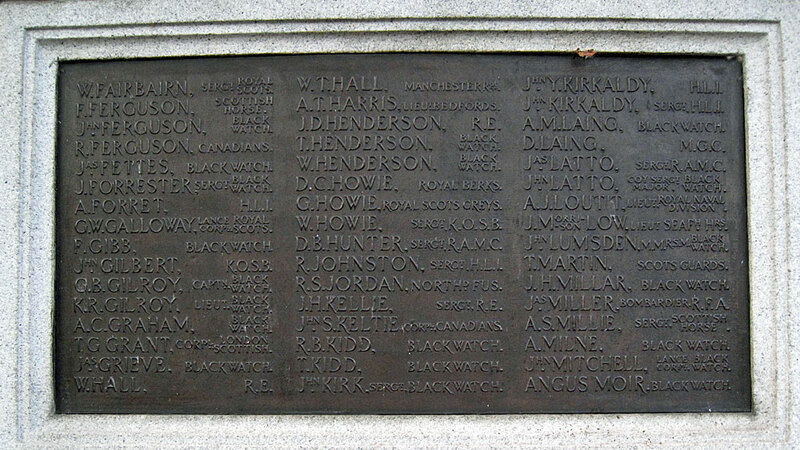 The WWII dead are listed on a metal plaque fixed to the lower face of the pedestal, however, when I visited these names had been temporarily obscured by wreaths laid on Remembrance Day. 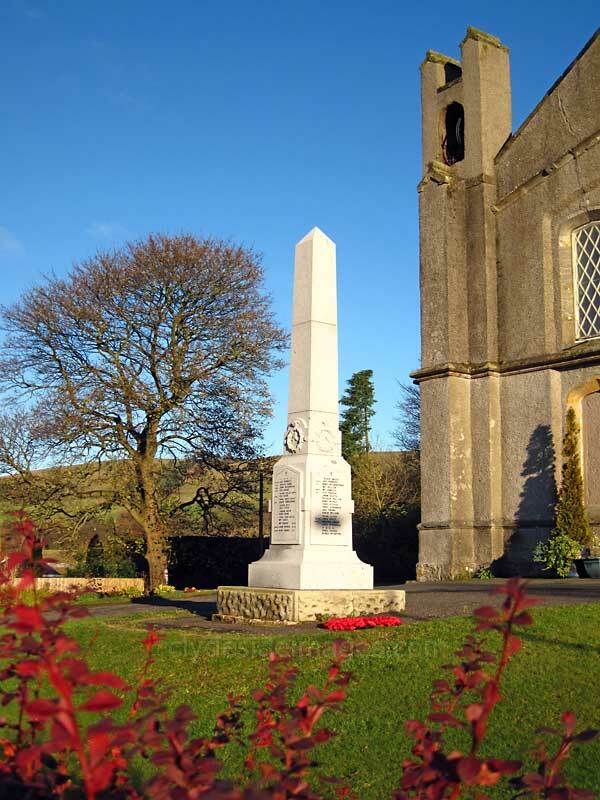 The monument stands at the West end of the town adjoining the Bowling Green. There is also a 'Victory Fountain' which stands adjacent to the monument. 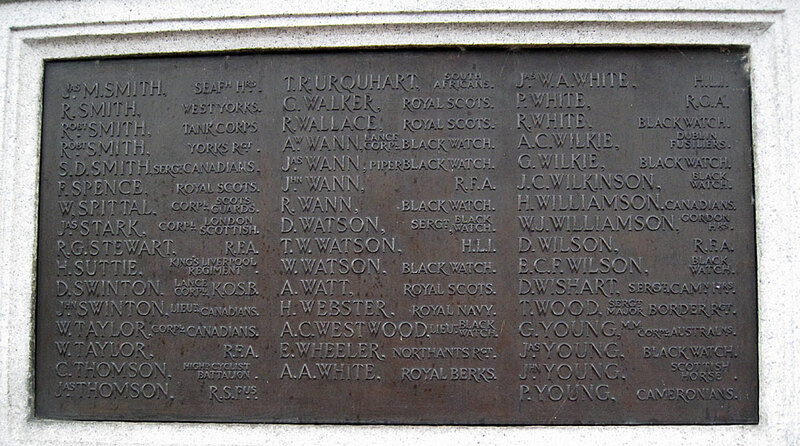 A large percent of the casualties listed on the Newburgh memorial served in the Black Watch, so many in fact that an individual panel (left) was allocated for the names. 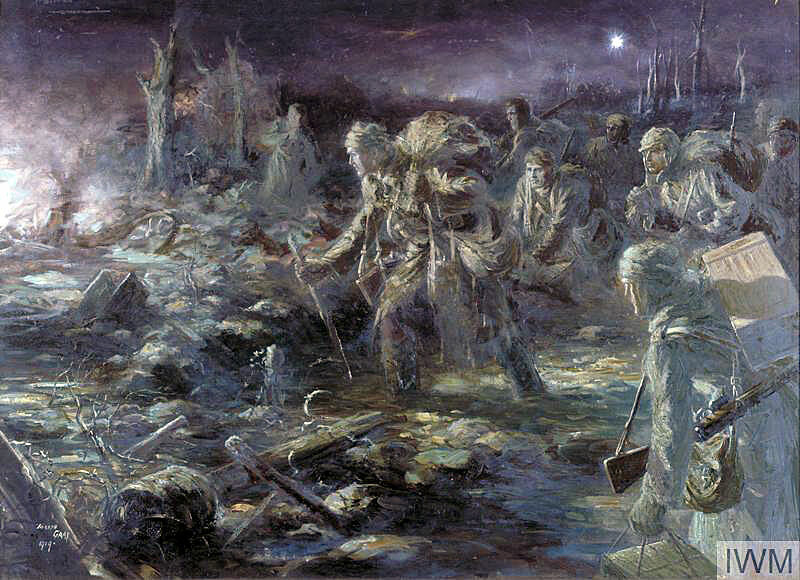 This Joseph Gray painting, held by the Imperial War Museum, depicts a Ration Party of the 4th Black Watch moving across a devasted landscape at night during the Battle Of Neuve Chapelle in 1915. The Black Watch regimental memorial stands on the banks of the River Tay at Aberfeldy in Perthshire and was the work of the sculptor William Birnie Rhind RSA (1853-1933). 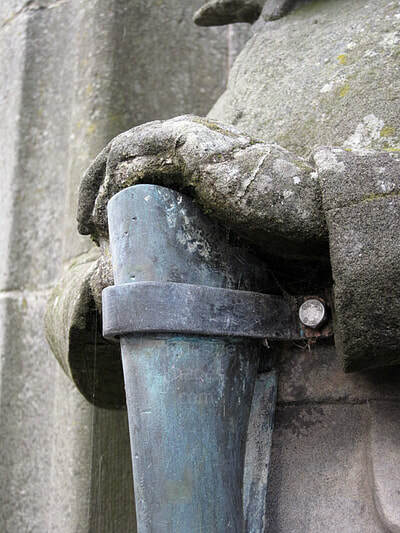 Alexander Carrick apprenticed in Rhind's yard and he appears to have based his Newburgh sculpture on Rhind's Black Watch soldier at Aberfeldy, presumably inspired by, and as a tribute to the older artist. The pose and twisting action as Birnie Rhind's soldier draws his sword, and Carrick's infantryman draws his bayonet, are very similar. 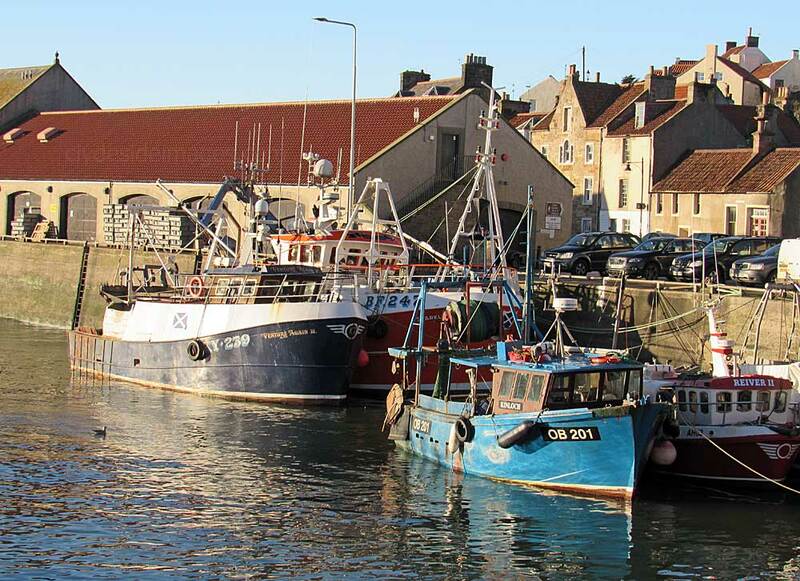 ​St Monans, sometimes spelt St Monance, is one of several picturesque fishing villages in the East Neuk of Fife and is named after the legendary Saint Monan. 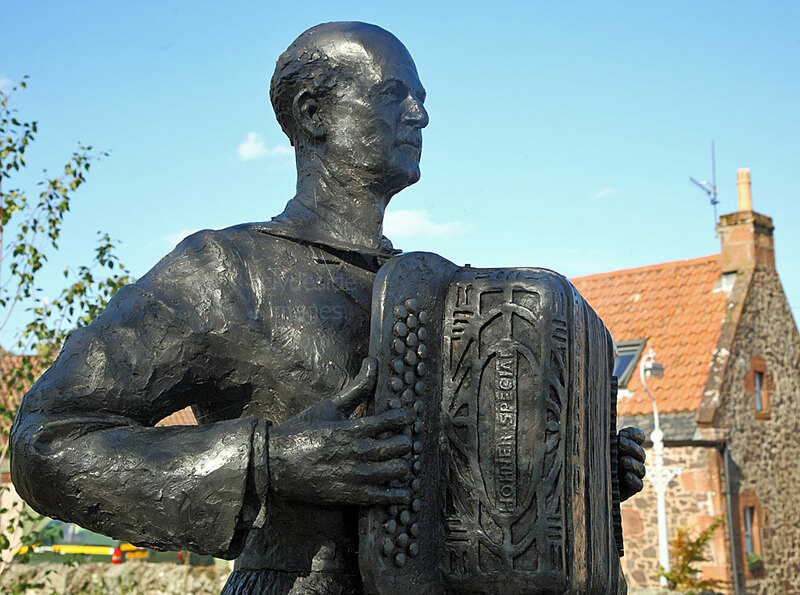 Situated approximately 3 miles west of Anstruther, this small community, whose inhabitants formerly made their living mainly from fishing, is now a popular tourist destination and lies on the long-distance Fife Coastal Path which stretches 117 miles from the Firth of Forth in the south, to the Firth of Tay in the north. 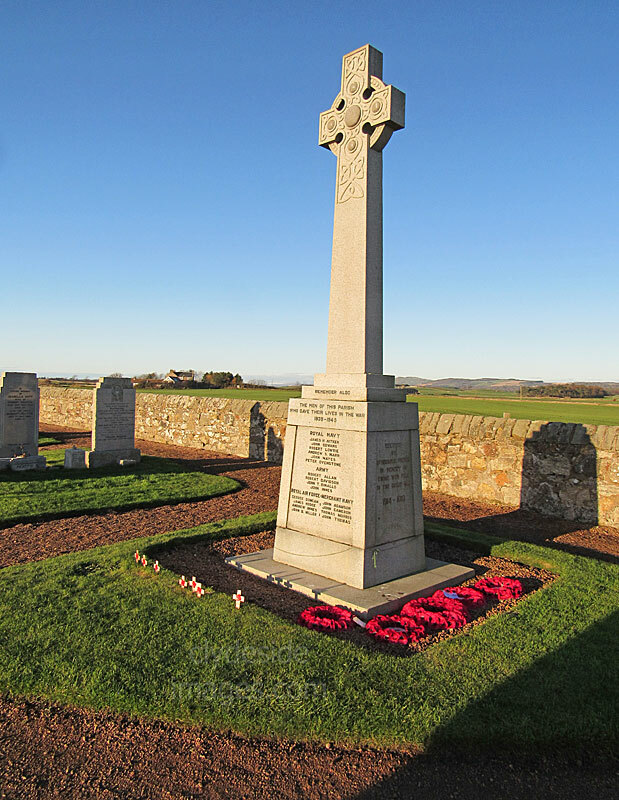 ​The Saint Monans war memorial is a grey granite Celtic cross with wheel-head, bosses and Celtic carvings in shallow relief on the cross-head face. 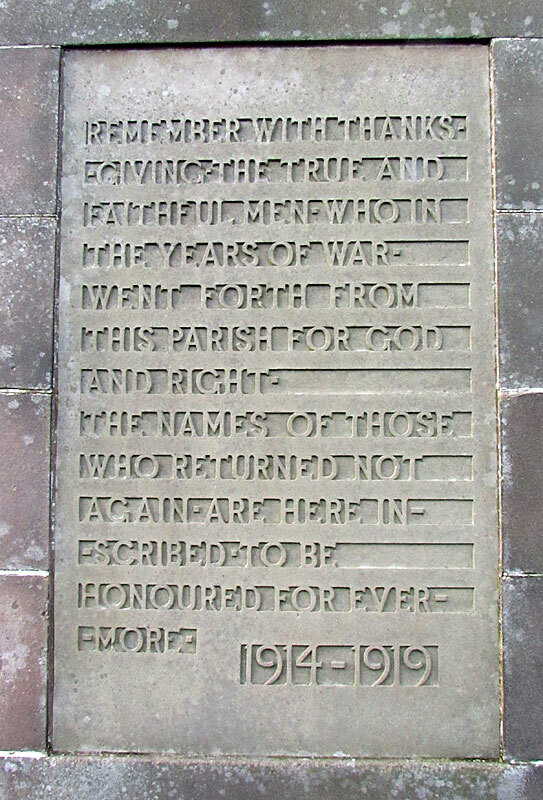 The cross stands on a tapering pedestal with the commemoration and names of the dead set on the faces in lead lettering. Both First and Second World War casualties are listed. The village contains numerous historical buildings, many of which haven`t changed drastically over the years. 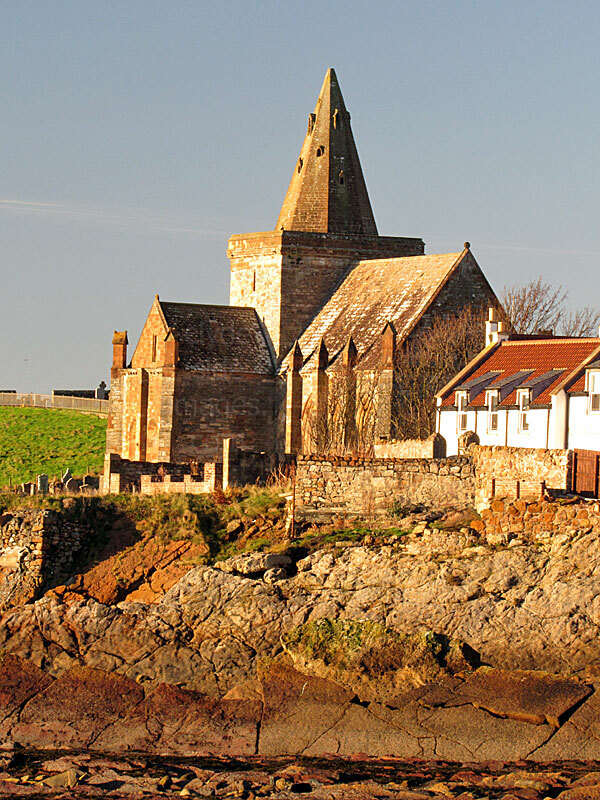 These include brightly-painted waterfront properties, the now defunct windmill that once powered the local salt panning industry, and St Monans Church, also known as the `Fishermen`s Kirk`, which lies on the western edge of the village just above the shoreline. Continuing west from there is the 16th-century ruin of Newark Castle, a manor house that has deteriorated drastically as a result of exposure to the elements and cliff erosion. In 2002, attempts to carry out restoration proved unsuccessful. 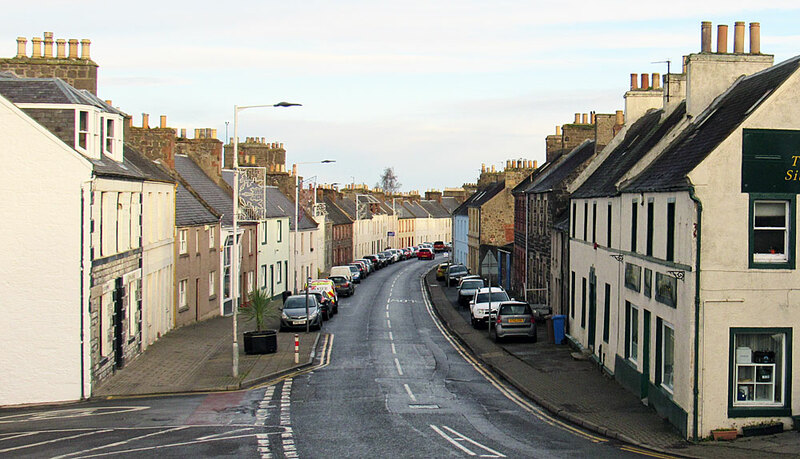 ​The East Neuk, or `Corner` in old Scots, comprises the most northerly part of the Firth of Forth, a large inland area, much of which is relatively flat and farmed, and a series of fishing villages. In addition to St Monans, these include Elie, (below), with its award-winning beach, Pittenweem, Anstruther, and Crail to name but a few. The atmospheric harbours are a major draw for visitors but one of the most unusual modern day attractions is a Cold War era bunker near Crail, known as Scotland`s Secret Bunker, which I`ve yet to visit. It was constructed in the late 1950s to be a regional seat of government in the event of a nuclear war. The beach at Elie on a crisp winter`s morning. 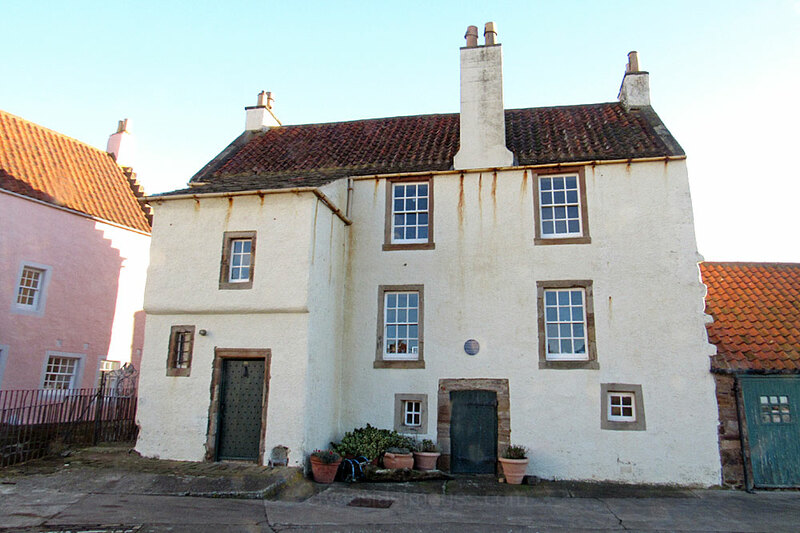 ​Gyles House (below), a harbour-side property at Pittenweem, was built in 1626 for a Captain James Cook (not to be confused with the famous British explorer and Navigator of the ship Endeavour who wasn`t born until 1728). 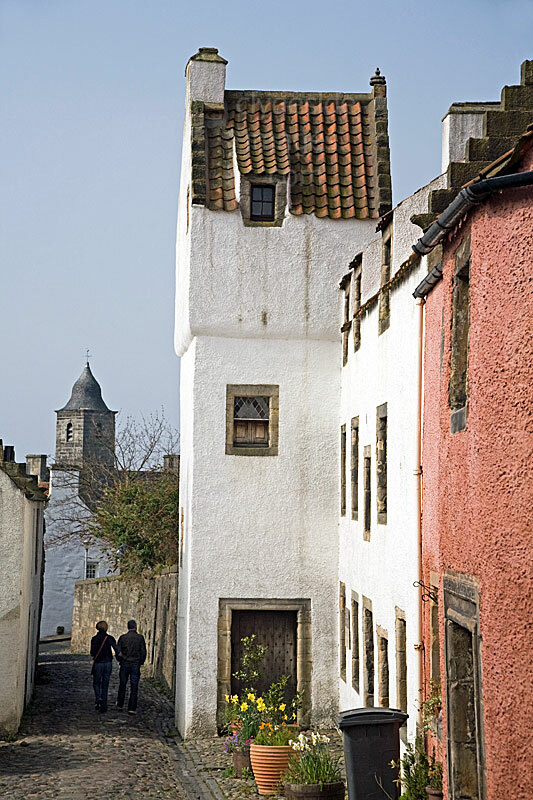 ​It is very similar in design to some of the buildings in Culross, a well-preserved village which lies almost 45 miles to the west. 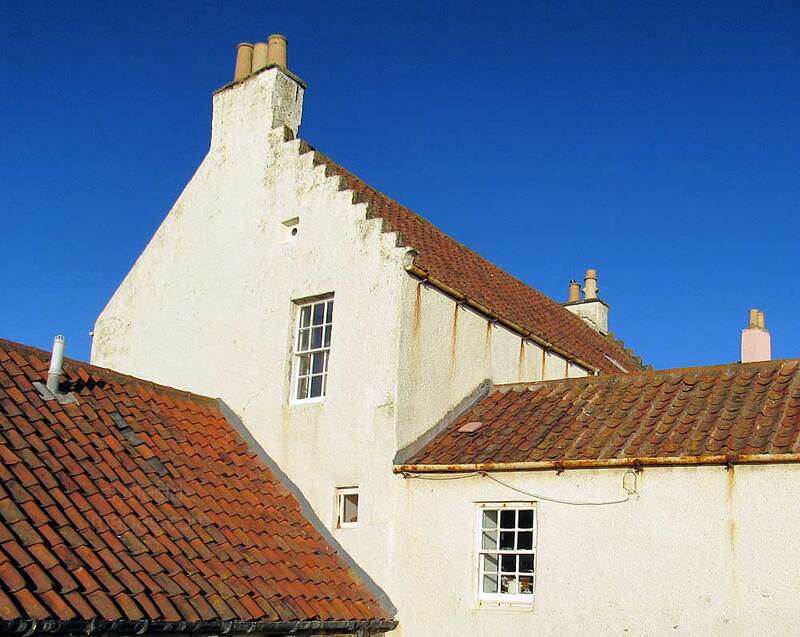 Cook married into the Horsburgh family and the house remained with this family for 300 years. There was a story that it was Cook`s ship that carried Charles II to France in 1651 after his defeat at the Battle of Worcester, which effectively ended the English Civil War (22 Aug 1642 – 3 Sep 1651), however, this claim has since proved to be a 19th century hoax. The portrait painter, John Henry Lorimer (12 August 1856 – 4 November 1936), restored Gyles House in 1930 and his initials can be still be seen on the gate. His nephew, the sculptor Hew Martin Lorimer (22 May 1907 – 1 September 1993) lived here in the 1930s and 1940s. Hew Lorimer was principally an architectural sculptor, and his profound religious beliefs had a lasting effect on his art and subject matter. After World War II, he worked on many grand sculptures, including Our Lady of the Isles, 1958, a massive granite statue of the mother and child sited at Rueval on South Uist. 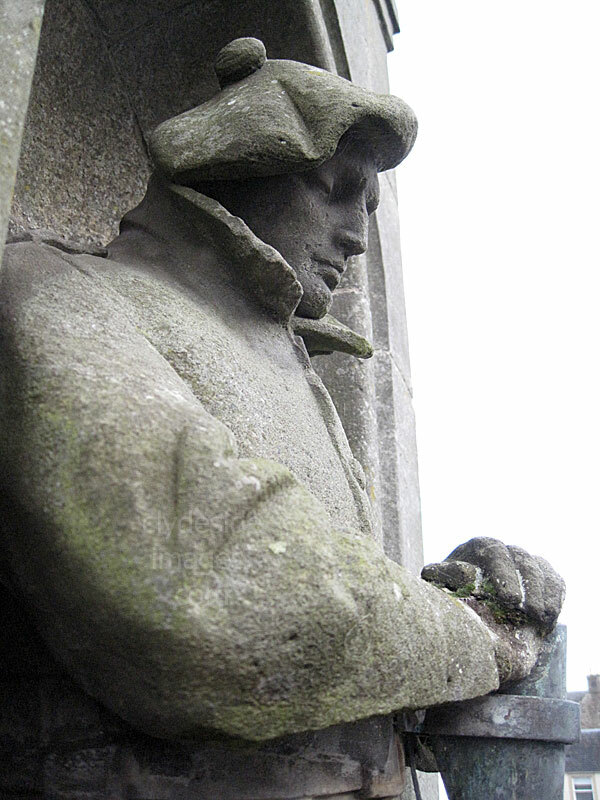 In the 1950s he also sculpted the artwork adorning the facade of the National Library of Scotland in Edinburgh, for which he produced a series of tall, allegorical figures, depicting history, law, medicine, music, poetry, science and theology. Lorimer, who lived in Kellie Castle in Fife, for much of his adult life, was awarded an OBE in 1986 for services to architecture and conservation. 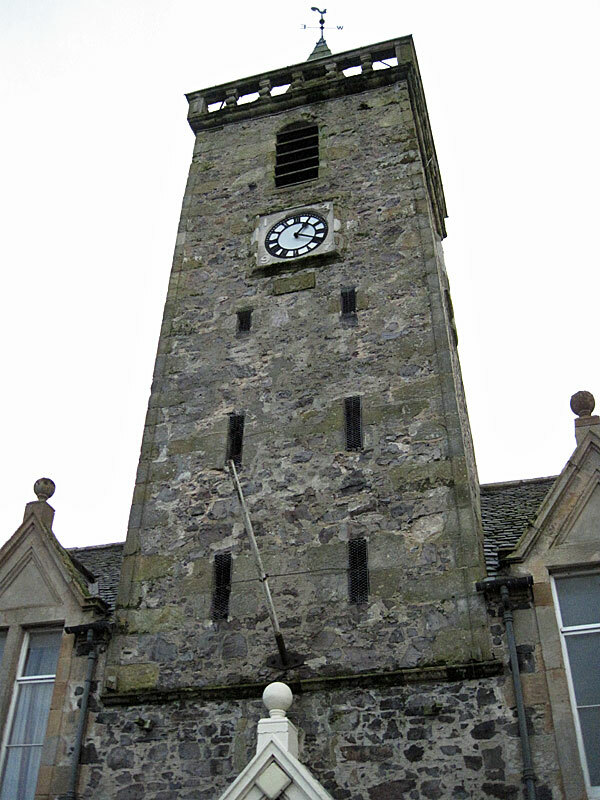 Saline lies approximately 5 miles (8 km) to the north-west of Dunfermline in Fife. In years gone by, the village was a busy weaving centre, unlike many other small Fife settlements where generations of men often worked in the mining industry. Several 18th century weavers` cottages survive in the village. 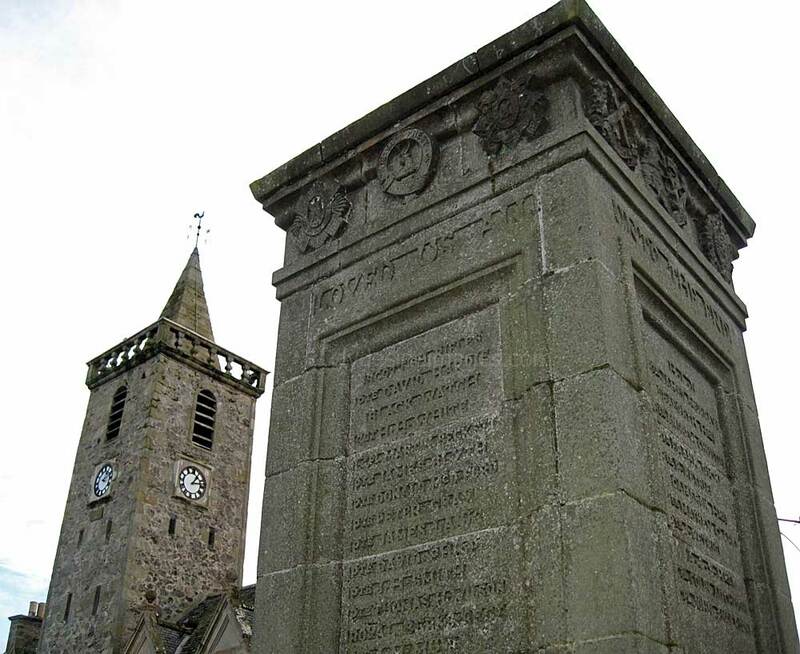 Saline`s war memorial occupies a prominent position in front of the village Parish Church. 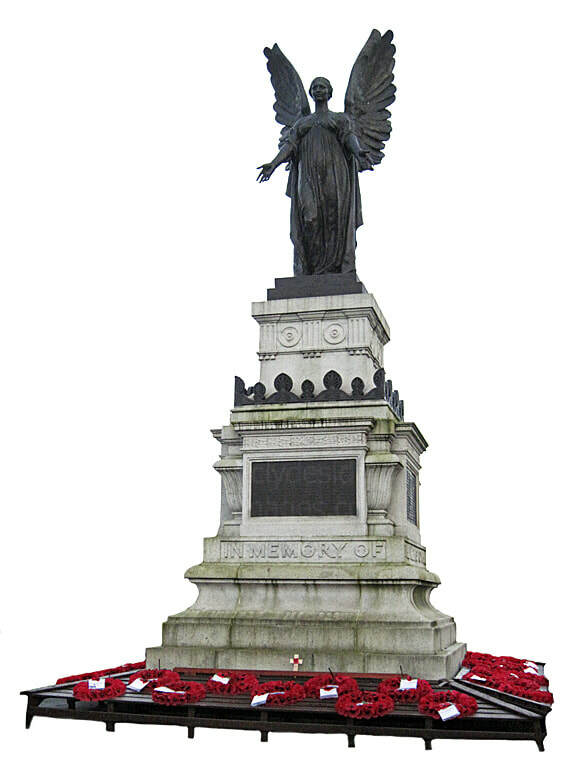 The memorial was unveiled in April 1921 to honour the local men who died serving their country in the Great War. 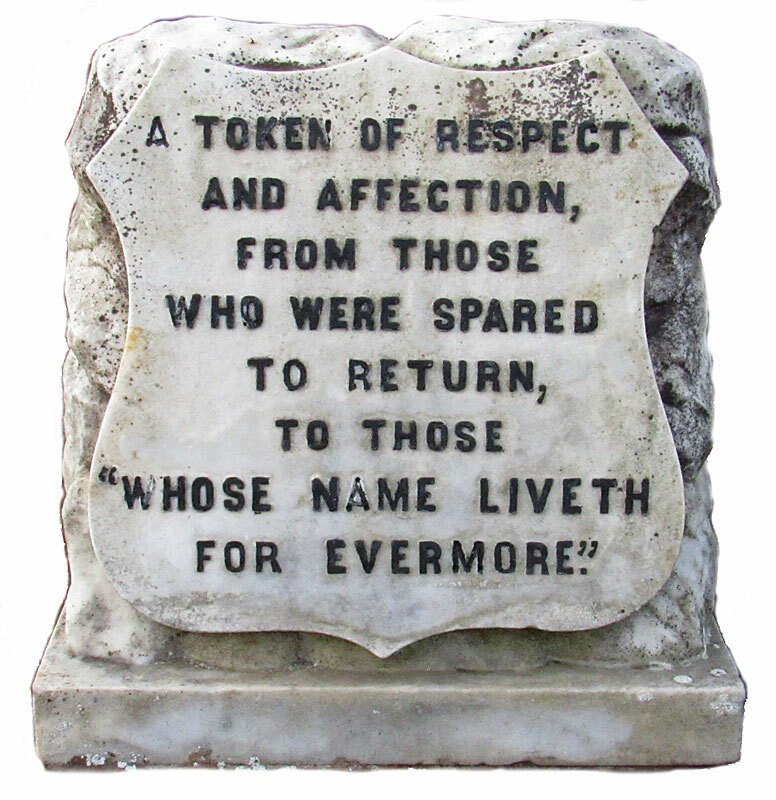 The base was subsequently inscribed to commemorate the community`s service personnel who lost their lives during the Second World War.